Would you like your new or remodeled swimming pool to boast a color plaster finish that’s even and consistent throughout the interior? That delivers lustrous color that endures for years? One that won’t fade or bleed color? If so, then you want to avoid dyed pool plaster, and instead, opt for newer, more effective alternatives. Whether you are planning a new pool or replastering an existing one, choosing the best color-finish material is among the smartest moves you can make. With the important roles that a pool-finish material plays, it’s important to understand the drawbacks to traditional plaster and how the ceramic-quartz option provides a superior result on multiple fronts, including the color. What is marcite pool plaster? First, let’s review the traditional material used for pool plaster, marcite. For decades, pool builders relied exclusively on this material—white cement mixed with crushed marble dust and fortifying additives. During the final step of pool construction, crews apply the material—which is inherently white—to the pool interior. The result is a smooth coat throughout. Marcite is a proven material for inground pools. 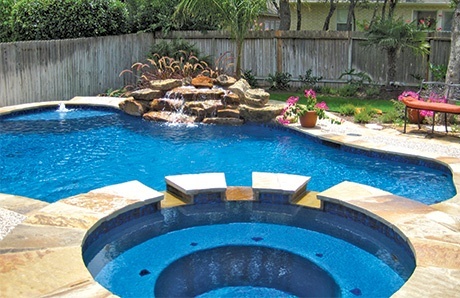 You can find it in hundreds of thousands of backyard pools across the globe, and its initial price tag is reasonable. However, plain marcite plaster has its fair share of shortcomings. It’s susceptible to a host of troubles that harm your pool’s appearance and create long-term maintenance costs and requirements. Among them: chips, etching from chemicals in the water, fading color, deterioration from ultraviolet rays, erosion from harsh and unbalanced water, and abrasion from mechanical parts, such as the wheels of some automatic pool cleaners. During the application process, plaster crews can take white marcite mix and create color pool plaster. When they prepare a batch of wet plaster, they include an additional ingredient to do the job: a colorant. Two kinds of additives serve as colorants in pool plaster: One is organic pigments, made from plants or animals. The other is inorganic pigments, derived from metals and non-carbon-based materials. Organic pigments can produce vivid colors and are more affordable. However, they don’t hold their color as well as inorganic ones. 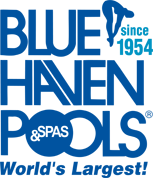 Organic pigments are particularly vulnerable in pool water that’s treated with chlorine or after years of exposure ultraviolet rays. Used as plaster colorants, pigments are the number-one predictor of marcite color. However, the final appearance can be impacted by the pool’s depth and the amount of direct sunlight the pool receives. Now, if you think that you can achieve a colored pool interior with marcite, you are correct. But you will also be setting yourself up for frequently occurring problems. Although white marcite plaster can be tinted in shades of blues, greys, tans, and blacks, many pool builders and plastering companies avoid this precarious tactic. The reason: Colored marcite is notorious for fading, streaking, leaching, uneven coloration, and magnifying slight blemishes. Choose this dicey color treatment, and don’t be surprised if your pool builder or plasterer hands you a “dyed plaster waiver form.” On it, you will typically see a list of potential complications—and a signature line for you to sign off and accept the risks. Better alternatives for your pool’s interior are available—especially if you want a long-lasting color finish. One is pebble. This distinctive, upscale form of plaster includes marcite with tiny colored pebbles mixed in. This option is a great choice for higher-end project budgets in those U.S. markets where this specialty upgrade is available. The other excellent option is ceramic quartz aggregate. This attractive, increasingly popular material—which comes in an array of colors and blends—has been used in tens of thousands of inground pools around the country since the late Nineties. What is the ceramic-quartz option? An innovation originally pioneered by the industrial giant, the 3M Company, this aggregate product comes from combining two distinct elements into a winning team. The first is quartz—one of the world’s hardest minerals. Unlike marble, which can dissolve from ongoing exposure to pool chemicals, quartz is completely insoluble. Raw quartz is mined from the earth, and the mineral serves as a key element for making a form of highly durable color pool plaster. The second is ceramics. Through the centuries, ceramics have been a leading method of preserving colored surfaces. The process involves firing ceramic pigments at high temperatures to bond them to clay objects and make them more durable and less porous. Modern production techniques make the ceramics process even more effective. Today, adding color to the objects—from porcelain veneers to quartz granules—occurs within a controlled factory setting. 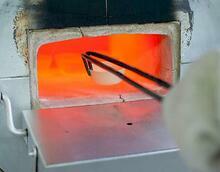 Blazing hot temperatures bake pigments onto the surface of each granule—achieving permanently bonded ceramic color. Plastering crews mix the colored granules with regular marcite plaster to create a blend for a pool’s interior. Using metal troweling tools, crews apply this enhanced blend in the same manner as traditional plaster. However, the benefits are anything but the same. The advantages that come from the quartz aggregate blend make it well-worth incorporating into your new pool or remodel project. The material is engineered to deliver superior looks and greater performance over traditional colored pool plaster. To create a durable color finish for swimming pool interiors, ceramic-coated quartz granules are blended into a marcite plaster base. To begin with, this upgraded form of color plaster looks great in any new or existing pool. The blend delivers a richer, more uniform color with a multidimensional appearance—versus a flat white, blue, grey, or black that comes with plain marcite plaster or a dyed variation. On the other hand, quartz and color combine as an attractive, high-performance duo. Plain colored marcite plaster simply can’t beat this dynamic pairing in the looks department. Quartz comes in a range of colors, including tans, whites, grays, blues, reds, plums, and teals. You can also ask about local availability to upgrades to deluxe varieties with greater ability to reflect light and sparkle in the sunshine. Each color helps create a unique kind of look or style. For example, tan is a great choice for a lagoon pool styled to mimic in a natural setting, while a blue might work better for a Grecian pool in classical surroundings. Colors address other design considerations as well. Blues, greens, and teals show well in sunlight. Deep grays and blacks reflect the sky to produce a contemporary, mirror-like effect on the water’s surface that some homeowners prefer. Additionally, the ceramic element in the finish ensures incredible color. Bonded ceramics won’t fade or bleed color. In fact, as the pool ages and tiny amounts of the marcite wear away, more surface area of each granule becomes exposed—revealing even more beautiful color! Beyond its handsome appearance, a quartz interior delivers on functionality and long-term endurance. Hands-down, this finish outshines plain marcite with its superior resilience. The reason: So much of the pool’s interior is covered in this tough mineral—with its innate strength providing protection. After all, according to the Moh’s Mineral Hardness Scale, quartz is harder than steel! With ultra-strong quartz fortifying the plaster mix, the resulting surface offers tremendous performance. The problems that plague plain marcite finishes—damaging the surface’s appearance and shortening its lifespan—do not impact a quartz blend in the same way. One reason why is that quartz does a significantly better job at fending off erosion from pool water chemistry. Ditto for ultraviolet deterioration. Another performance factor relates to the formation of stains. Plaster stains arise from conditions ranging from poor water maintenance to certain kinds of tree leaves falling into the water. The culprits can seep into marcite, which is porous, creating blemishes that require brushing or other efforts to remove them. However, with quartz, the ceramic exterior is non-porous; since nothing can get a foothold on the quartz granules’ exterior, it will not stain. Now, the marcite portion of the plaster finish is porous. However, because it’s married with protective quartz granules—which interrupts a stain’s path of attack—the overall surface becomes more resistant to unsightly stains. Quartz’s immense durability offers another advantage that puts plain marcite to shame: With this mineral blend, you will have a strong, brilliant pool surface unlikely to need acid washing—and the accompanying cost, hassle, and massive water consumption required by this chemical treatment! When it comes to standing the test of time, a quartz interior beats plain or colored marcite hands down. It will last five to ten years longer! That means you save money by significantly extending the time before a re-plaster is needed. Now that you understand the advantages that color quartz brings to any gunite pool think hard (yes, pun intended) about including it in your new backyard resort or replaster job. Why would any pool owner settle for a marcite finish and its various weaknesses—particularly if the goal is an attractively colored pool finish? While this upgrade may cost about 20 to 50 percent more than plain marcite, the value it delivers makes this price increase well worth it! By investing a little more upfront, the quartz option will provide you with a better-looking pool, ongoing ease, savings in ownership, and the assurance of dazzling impact that will last for years longer than plain marcite plaster.